Now, if you ever wanted a set of abc flash cards that could put a pep in your step and turn your frown upside down, then these are the ones for you! Just take a look at that cow. Doesn’t he make you just want to smile? 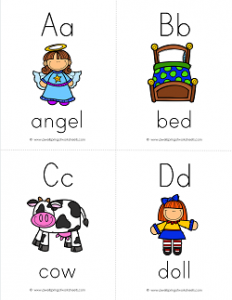 These abc flash cards serve more than just that purpose. They come with a neat traditional manuscript of the uppercase and lowercase letter at the top of the card, have a picture of an object that starts with that letter in the middle of the card, and the word naming that object at the bottom of the card. Great for matching letters to their sounds.